What’s the Best Credit Card for My New Year’s Celebration? 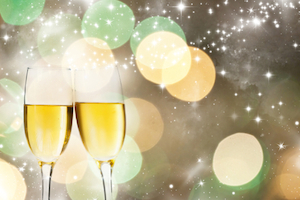 Planning an epic New Year’s celebration? In addition to high spirits and good company, you’ll need the right credit card to pull it off. Check out the Nerds’ top picks below — we have a solid recommendation for every type of fete. Bar hopping is a popular New Year’s eve activity, so if it’s on your agenda, be sure to take the Chase Sapphire Preferred® Card along. With it, you’ll earn 2 points for every dollar spent on travel and dining out and 1 point for every dollar spent elsewhere. Generally, points earned with the Chase Sapphire Preferred® Card are worth $.01 apiece, but if you redeem them for travel through Chase Ultimate Rewards, their value goes up by 25%. Assuming that this is how you use your points, you could be earning 2.5% back on every drink you order — bars usually count as “dining out.” Score! But the Chase Sapphire Preferred® Card also offers another option when it comes time to cash in your points: You can transfer them at a 1:1 ratio to participating frequent traveler programs. If you’re an experienced travel hacker, this is a huge opportunity to wring a lot of value out of each point. The Chase Sapphire Preferred® Card is also a great option if you frequently travel overseas. It charges no foreign transaction fee and comes chip-enabled. Finally, this card offers a stellar signup bonus: Earn 60,000 bonus points after you spend $4,000 on purchases in the first 3 months from account opening. That's $750 toward travel when you redeem through Chase Ultimate Rewards®. Keep in mind that it carries an annual fee of $95. If the bar scene is a little too wild for you, using the Blue Cash Preferred® Card from American Express to host a party at home is a smart idea. With this card, you’ll earn 6% cash back at U.S. supermarkets, up to $6,000 spent per year (then 1%). You’ll also earn 3% cash back at U.S. gas stations and select U.S. department stores, and 1% cash back on all other purchases. Since having a party usually means buying a lot of food and drinks, using the Blue Cash Preferred® Card from American Express to stock up at the supermarket will earn you a hefty pile of cash back. In terms of a welcome bonus, the Blue Cash Preferred® Card from American Express offers a generous one: $200 statement credit after you spend $1,000 in purchases on your new Card within the first 3 months. Terms Apply. The annual fee is $95. If you’re spending a lot at the supermarket throughout the year you’ll likely still come out ahead because of the card’s high rewards rate. Headed to a movie theater or live event this New Year’s eve? If so, be sure to take along the Citi ThankYou® Preferred Card. With it, you’ll earn 2 ThankYou points for every dollar spent on entertainment and dining out and 1 ThankYou point for every dollar spent on other purchases. This means you’ll be racking up extra points on nearly any type of ticket purchase you make. Also, keep in mind that the Citi ThankYou® Preferred Card provides access to another benefit that could make your holiday sparkle: Citi Private Pass. Private Pass will give you the opportunity to buy exclusive tickets to a wide range of entertainment events, so be sure to capitalize on this feature. When it comes time to redeem all those ThankYou points you’ve been earning, you’ll have a wide range of options. But the Nerds recommend using them for gift cards or cash equivalents. This way, you’ll get the most value out of each point. Since all these great perks come at an annual fee of $0, this is definitely a card to keep on hand. Here’s to a happy, healthy and financially savvy New Year!